Today is day #1 of our series exploring the ideas of thought leaders in education. 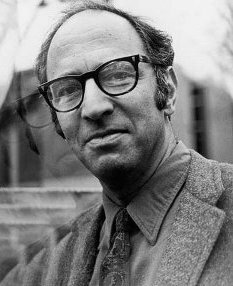 We begin, though, with an unorthodox choice: Thomas Kuhn. Kuhn was not an educator, but rather a scientist and historian. However, his theory of “revolutionary science” and paradigm shifts has plenty of implications for our work in schools. You may remember that we posted an introduction to his ideas a few weeks ago, but today we’ll delve more fully into his theory. Kuhn’s book The Structure of Scientific Revolutions explores the process by which new paradigms come to replace old ones in science. For instance, the paradigm of geocentrism, the view that the earth is the center of the universe, was replaced by heliocentrism, which assumes that the earth and other planets in our solar system revolve around the sun. The concept of a paradigm shift can be explained (with some limitations) through the visual gestalt below, which could be interpreted as either a duck or a rabbit depending on how you look at it. Try to see it both ways. The duck’s beak, when considered from a different perspective, becomes the rabbit’s ears. Let’s start in the “duck” paradigm. Imagine that each pencil marking is a scientific “fact” that has been discovered. You make sense of each marking, or fact, in the context of the image of the duck. You did not construct the duck paradigm — it’s the product of an entire scientific community and you were likely taught to see this image as a duck. Any new markings, or facts, just confirm the duck image in your mind. When looking to discover new markings or facts, you look within the framework of the duck. But imagine that more and more markings, or facts, accumulate over time and you come to see something different. The shape of the back of the duck’s head doesn’t look quite right, and you realize that the beak is too thick to be realistic. You start to question your original assumptions — how do you make sense of all the new information that doesn’t quite fit the duck paradigm? The answer? Paradigm shift: “Ah ha! This is not a duck, it’s a rabbit!” Now all of the markings, or facts, you had before make sense in a new way. In some disciplines, more than one perspective can exist at once. The visual gestalt works this way — we can consciously shift our perspective and see either animal, moving fluidly back and forth between the two. The image can be BOTH rabbit and duck. But in science, a paradigm shift is more than just a different way of seeing. Once a new paradigm begins, the old paradigm is no longer valid because it cannot adequately account for all the discovered facts. How does this happen? The shift from one paradigm to another occurs when enough anomalies to the current paradigm build up, causing scientists to question the foundational principles upon which their worldview rests. During “normal science,” when the current paradigm is in place, these anomalies are discounted as acceptable levels of error. However, during “revolutionary science” or a paradigm shift, these anomalies become the center of attention as scientists attempt to construct a new world view that incorporates and explains them. 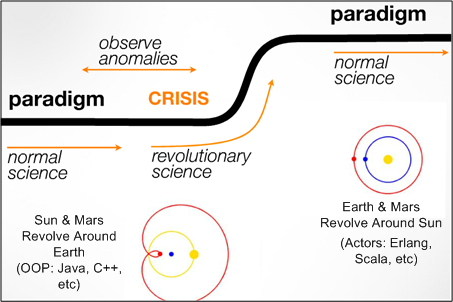 This period of intense focus on explaining anomalies and developing a new paradigm is considered “revolutionary science,” and it is sparked by a “crisis” where the old paradigm fails explain key anomalies or outliers. Once a new paradigm is developed, however, there is a return to “normal science” under the new worldview. This is just a summary of a few of Kuhn’s key ideas, and enough to get us started. Please continue investigating his theories here and here to learn more. Or, if you’re so inspired, buy his book — it’s a worthwhile read! 1) What is your current paradigm of education? What is your “view of the field, its methods, and its goals”? What theories do you operate from and base your practices upon? 2) What experiences and data confirm this paradigm? How does this paradigm impact the way you conduct “research” (collect data and experiences) and interpret your findings? 3) What anomalies challenge us to reconsider our paradigm? For instance, many of us hold tightly to the theory that intelligence is malleable and all students are capable of achieving the same level of mastery over the content and skills we teach. But the “facts” tell us that all students do not actually achieve at the same level. Many of us believe our purpose is to prepare students to be successful in college, but a shockingly low number of students actually are successful when they enter college. What do we make of facts like these that challenge or complicate beliefs and assumptions we hold? Can problems like these be “solved” in our current paradigm? 4) Is change in educational paradigms revolutionary or evolutionary? Can multiple paradigms co-exist, or must the new supplant the old completely? 5) Have we hit a “crisis” yet? What would “revolutionary education” look like? 6) What is the value of inexperience in our field?